Infrared saunas are not just the latest health fad panacea. With claims that they can make you skinny, alleviate pain and even have benefits to Type II diabetes sufferers can they really do all they claim they can? We think so. You probably know how a traditional sauna works—crank up the heat and the warmth penetrates your body from the outside in promoting benefits such as generating a good sweat. Infrared takes the health benefits of saunas and puts them on overdrive. Infrared heat is very gentle. The experience is similar to lying in the sun on a warm day, and feeling the heat radiate to the core of your body. Traditional saunas heat the air around vs. the body directly. Rather than inducing detoxification and relaxation, this can make the experience unbearably hot and create difficulty breathing. 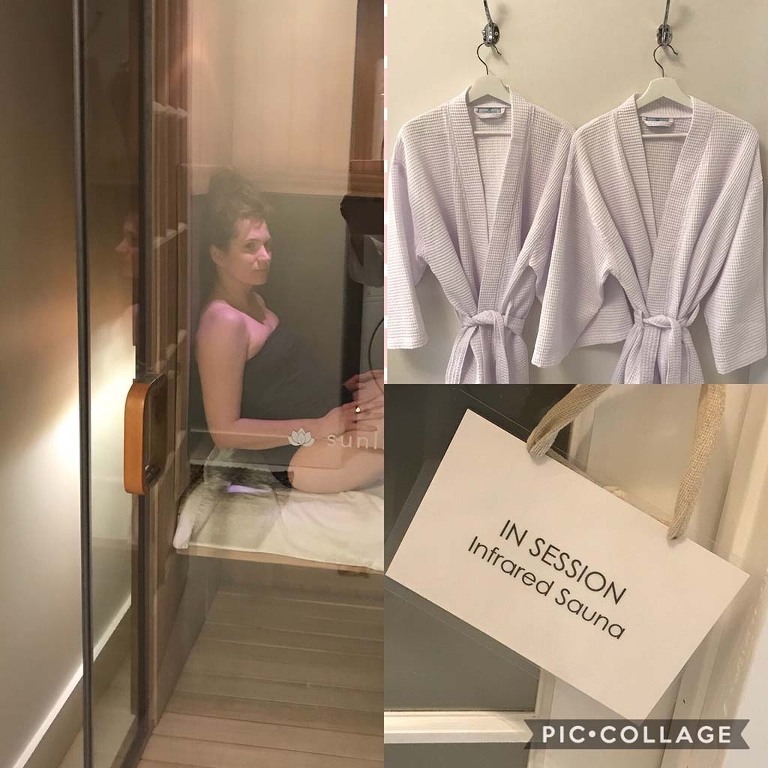 Because infrared heat penetrates human tissue vs. simply heating the surface of the skin, infrared saunas are seven times more effective than traditional saunas at detoxifying the body. Using light waves that mimic the rays of the sun to heat the body from the inside out, infrared rays penetrate deep into your skin, dissolving those accumulated toxins and vitalizing your cells and your metabolism. Holístico features a state of the art, full-spectrum infrared sauna which emits near-, mid-, and far-infrared heat. “I truly believe that infrared saunas can enhance a healing session profoundly and in many ways,” says Deborah. In Chinese medicine, heat is thought to create movement in the body system and cold creates stagnation. Stagnation is thought to be the cause of pain and other imbalances. Because heat creates movement and movement moves pain, the infrared sauna will help prepare the whole body for treatment and helps it hold and deepen a treatment’s effects. Research done in Japan revealed that patients with chronic pain who sat in an infrared sauna experienced a nearly 70% reduction in pain. In fact, it’s recommended you don’t shower for at least an hour after using the sauna to maximize the benefits of the infrared sauna. Even when you step out of the sauna, the healing continues. The health benefit promoted by the saunas depends on the light band used. Here is the breakdown and the benefits of each light band. Near infrared (NIR) is the shortest wavelength, easily penetrating the skin’s surface. This one focuses on skin and skin healing. NIR has been shown to significantly improve skin health and appearance, and even help wounds heal faster. A study published in The Journal of Cosmetic and Laser Therapy showed significant improvements in skin appearance after just 12 weeks of near infrared treatments. Participants experienced a reduction in wrinkles and crow’s feet, as well as improved overall skin tone, including softness, smoothness, elasticity, clarity and firmness. Mid infrared (MIR) is a longer wavelength that can penetrate deeper into the body’s soft tissue where inflammation occurs, increasing circulation and releasing oxygen to reach injured areas. This reduces pain and speeds the healing process. It is an excellent option for athletic recovery. Plus, when used in combination with far infrared waves, MIR effectively stimulates the cardiovascular system and raises body temperature. As the body works to cool itself, heart rate, cardiac output and metabolic rate increase as they do during exercise. This in turn supports weight loss. Far infrared (FIR) is the longest wavelength. Far infrared penetrates fat cells, allowing the greatest level of detoxification and stimulates your metabolism to aid in weight loss. FIR raises the core body temperature and produces a deep, detoxifying sweat at the cellular level, where most toxins reside. Far infrared also aids in blood pressure reduction & weight loss, burning up to 600 calories in one 40-minute session! By using the infrared sauna regularly, you do more then detox. Your body gets washed with relaxation, healing accelerates, skin rejuvenates, calories burn, hormones, like cortisol, come to a state of equilibrium. So what are you waiting for? © 2018 Holistico Wellness & Beauty|ProPhoto Photo Blog|Design by Northfolk & Co.